There's no getting used to working a clinic day! Each clinic has it's surprises - like life, just when you think there is a pattern things changes. April's clinic was one surprising challenge after another. The good part is that everything ended well - but OMG, what a long day! Anne got home at 7:30! Katherine and Isabel picked up a pregnant dog early in the day in Tecuitata and returned her minus 5 fetuses - they got home at 9! Those two would do anything for a dog in need. While being transported to the clinic, a dog broke out of his kennel and jumped out of the truck. He arrived in too poor a state to be sterilized. We don't have x-ray so we didn't know the extent of his injuries. 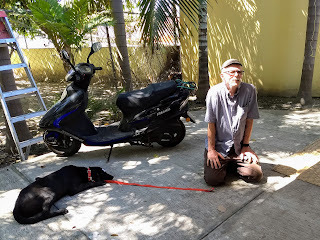 Wally took him to our friend, Medico Dibildox in Tepic. They were met at the curb by caring vet techs. 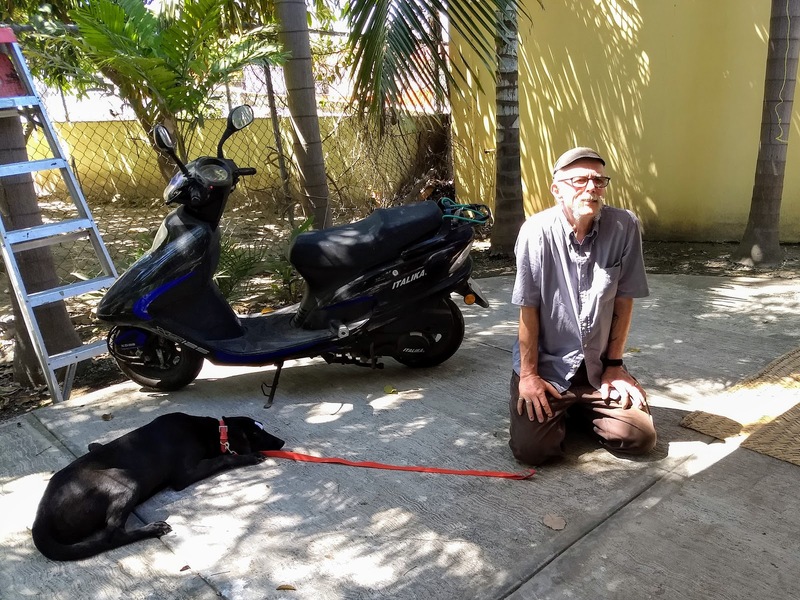 The dog had a broken femur and was quickly and expertly treated. We only had 3 cats, 1 male and 20 dogs: 14 females, 2 terminated pregnancies and 6 males. One cat had a tumor in her throat and mouth. 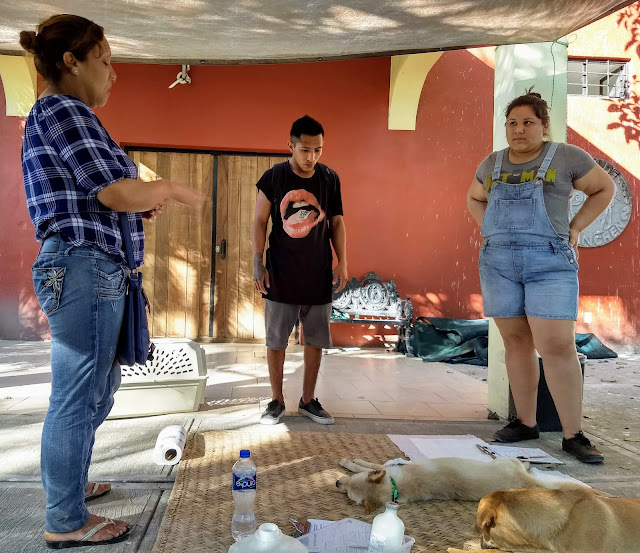 Again, we are not set up for that kind of treatment but Anne offered to help with the cost of the surgery in Tepic and Nena and Isabel volunteered to take her on Monday Those three would do anything for a cat! One of our last patients had a bad reaction to the anesthesia but was successfully resuscitated by Ana. In Dr B's words, she is " a marvelous nurse who never gives up". Ana also cared for a man who fell on the street, cleaning and closing his wound. Everybody went beyond their duty. Each animal is distinctly unique, just like us. We only need eyes to see and the willingness to respond with what we can. When we look back on the day we are amazed at what we accomplished together. Thank you Trini, Nena and Kenny for setting up and breaking down. Thanks Katherine, Minerva and Amaranth for doggie post op. Thank you Wally and Jenny for ambulance service to Tepic. Thank you Kate for feeding us despite an injured hand. Thanks for all the generous meals during the Fall and Winter clinics. You're beautiful! Thank you Dr B and Ana - you are both marvelous.! Thank you Anne for being the conductor of our little symphony. Thanks everyone for taking a string of problems and making beautiful music together. Take note everyone: BMA is growing. With an eye to the expanding needs of our community we want to be able to do more. Please join us in whatever way you are able. Thank you to our many friends! We began the day with a roster of 27 animals and after many twists and turns we finished the day surprising ourselves! This month there were several females pregnant or in heat - those dogs can't wait til the next clinic, in which case we shift to accommodate the need. 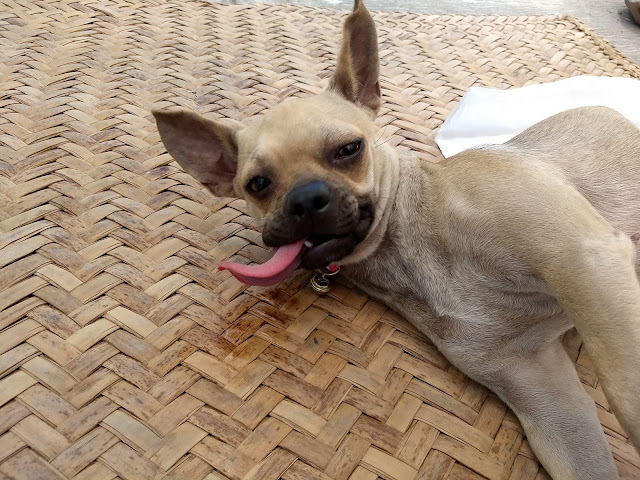 Roxanne, who came from San Blas by 7:15 to have her male chihuahua fixed gave her appointment to a female street dog that Amaranth pulled away from males on her way to the clinic. See how it goes? Anne somehow juggles all the unexpected without dropping the balls...in this case, the chihuahua's...jajajaja. Given the delicate condition of some of the females the day was long. 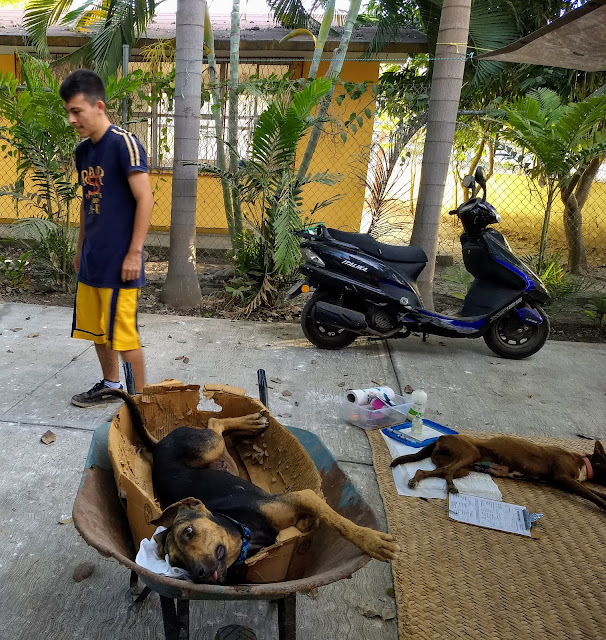 We treated 16 female dogs, 2 male dogs, 5 female cats and 1 male cat. 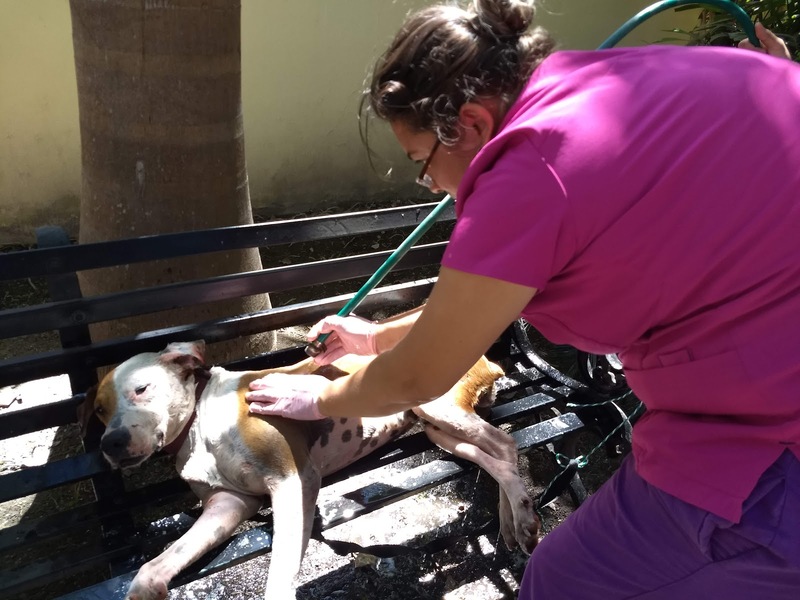 In addition we treated a female dog for venereal cancer and a dog traumatized by a dog attack leaving horrible bites in all 4 quarters. There were several street animals that kind citizens brought for sterilization - a good sign that community responsibility is on the rise. The crew took a break for a leisurely lunch in the shady courtyard. Friends of BMA stopped in to say hello: Audrey, Dave, Randy, Joan, Luis, Josie, and Bill. With so many friends it hardly feels like work! Grazie, Trilby for a deliziosa pasta e fagioli! Thanks, incredible Clinic Cirque de Soleil - Anne, Trini, Nena and Kenny. And our dog attendants: Jenny, Minerva, Katherine and Amaranth. Always a deep bow to Dr. B and Ana for their surgical artistry. And our MVP of the clinic: Audrey, for transporting 6 animals to various locations to and from the clinic - no easy feat especially after dark. These animals had no other means of getting treatment but for her willingness to be the ambulance and the driver...thank you!